Suzuki announced the recall due to an electrical wiring problem, which may lead to headlamp failure. 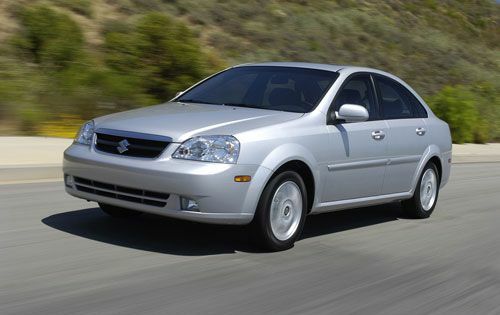 Suzuki Motor Corporation has announced the recall of 101,688 model year 2004-2006 Suzuki Forenza and 2005-2006 Suzuki Reno vehicles over possible headlamp failure. Specifically, certain models may experience electrical problems because of a melted splice pack, which connects the power circuits for the headlamp. Consequently, intermittent or total loss of the low/high beam headlamp function may occur. The recall notice warns that headlamp malfunction will lead to decreased visibility, increasing the likelihood of a crash. Suzuki has not indicated whether any injuries or crashes have resulted from the defect. The vehicles in question were manufactured from September 23, 2003, through March 7, 2006. The safety recall is set to begin next month, according to the National Highway Traffic Safety Administration. Suzuki dealers will reconnect the affected wires, free of charge. In the meantime, Owners may contact Suzuki at 1-714-996-7040. Concerned drivers may also contact the National Highway Traffic Safety Administration’s Vehicle Safety Hotline at 1-888-327-4236 or visit them online at www.safercar.gov. Suzuki issued an identical recall of Reno and Forenza models in 2007. The safety recall concerned 93,963 vehicles and ultimately resulted in an investigation by the NHTSA. The probe initially focused on 2005 Forenzas, but was expanded to include 2004-2006 Forenza and Reno vehicles. The investigation began on July 24, 2007 and concluded on October 2, 2007. Introduced in U.S. markets in 2004, the Forenza and Reno were essentially rebadged Daewoo Lacetti compact cars. Both models were discontinued in 2008, along with the Suzuki Aerio. The Suzuki SX4 sedan replaced the Reno and the Chevrolet Cruz has replaced the Forenza. As of 2011, the Daewoo Lacetti has been discontinued in all overseas markets. Founded in 1909, Suzuki Motor Corporation is the 9th largest automotive manufacturer in the world by production volume. It is also Japan’s 4th largest automotive manufacturer, behind Toyota, Nissan and Honda.